The false ˜Mickey Jones˜ is marooned in the 1990 Balkan wars - carrying a guitar and wearing an Elvis Presley jumpsuit. He meets a group of refugee children who hold him at gunpoint. Mickey has a choice; does he follow his Elvis dreams, or does he sacrifice them to save children whose only dream is to stay alive? 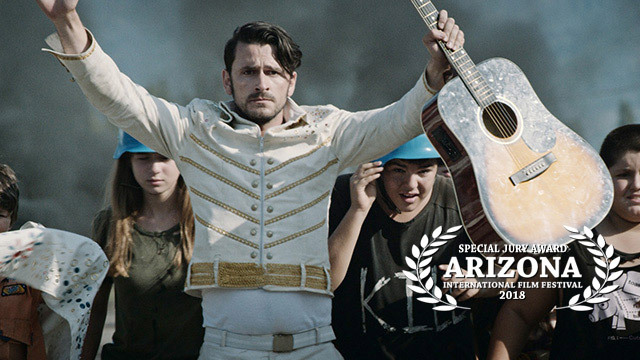 Elvis Walks Home is the drama of an individual who has no country and neither his own. This is a story about a man's journey from self-hatred to selflessness. The journey is never easy: he doesn't actually discover his own sense of self worth until he puts his own life in danger for the sake of others. Themes: War, Human Rights, Road Trip, World Cinema.